16 • WRAPS • 2 0 1 8 A dam Sumner of Wrapix Imaging in Burbank, Calif., start- ed his business as a sign shop but soon got into the wraps industry to combine his two passions—printing and cars. Sumner, who grew up in the offset printing industry, started Hayes & Co. Printing in 2007 and rebranded it as Wrapix Imaging six years later. 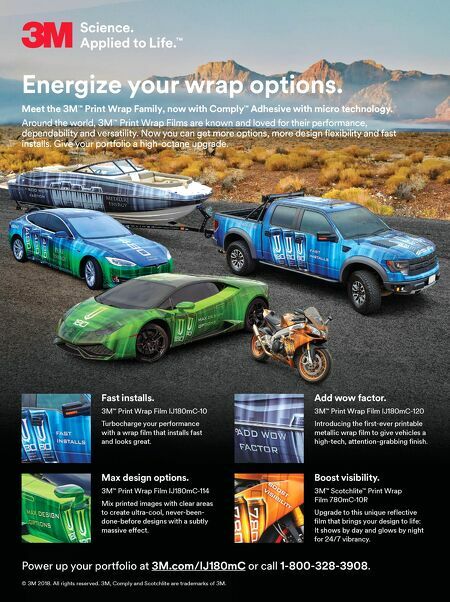 He installs wraps onto personal and commer- cial vehicles that help with marketing, add logos and designs, change colors and nishes, and protect the exterior paint. It helped that Sumner had some of the equipment he already needed, such as a wide-format printer and a laminator, to delve into an industry that appeals to a growing number of sign shop owners. He now has ve printers, a new laminator and at-bed mounting tables to install the wraps, which consist of a roll of lm or vinyl with adhesive backing that can be adhered to a vehicle, wall, oor, window or other surface. "I always had a passion for cars and wanted to explore the auto in- dustry and still apply the printing background I came from," Sumner says. "I get to work with those cars, and it's so fast-paced." GETTING STARTED IN THE WRAPS INDUSTRY Sumner, who also owns Wrapix Academy, a 3M-authorized training and testing facility for graphic installations, specializes in the design, printing and installation of wallpaper and architectural wraps with an emphasis on vehicle wraps from red carpet events to eet graphics. 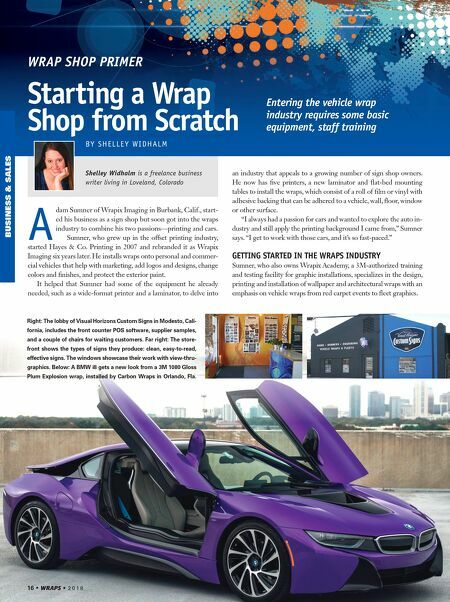 WRAP SHOP PRIMER BUSINESS & SALES Starting a Wrap Shop from Scratch BY S H E L L E Y W I D H A L M Entering the vehicle wrap industry requires some basic equipment, staff training Shelley Widhalm is a freelance business writer living in Loveland, Colorado needed, such as a wide-format printer and a laminator, to delve into Right: The lobby of Visual Horizons Custom Signs in Modesto, Cali- fornia, includes the front counter POS software, supplier samples, and a couple of chairs for waiting customers. Far right: The store- front shows the types of signs they produce: clean, easy-to-read, effective signs. The windows showcase their work with view-thru- graphics. Below: A BMW i8 gets a new look from a 3M 1080 Gloss Plum Explosion wrap, installed by Carbon Wraps in Orlando, Fla.